Nazca Lines - Theories, Peru, archaeo-astronomy, ancient astronauts. The shallow etchings were made well over 2,000 years ago by Indians who cleared the stony surface, exposing the whitish soil underneath. Scientists continue to debate their purpose, offering such theories as a calendar, a map of underground water supplies, ancient "message in the bottle" for the future generations (Picture 1)- even landing strips for space aliens. to the message attached to the Pioneer 10 spacecraft? plaque bolted to the spacecraft's main frame. 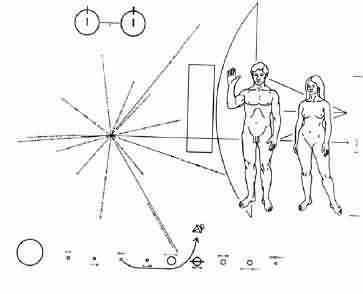 On the plaque a man and woman stand before an outline of the spacecraft. The man's hand is raised in a gesture of good will. The physical makeup of the man and woman were determined from results of a computerized analysis of the average person in our civilization. The key to translating the plaque lies in understanding the breakdown of the most common element in the universe - hydrogen. This element is illustrated in the left-hand corner of the plaque in schematic form showing the hyperfine transition of neutral atomic hydrogen. Anyone from a scientifically educated civilization having enough knowledge of hydrogen would be able to translate the message. The plaque was designed by Dr. Carl Sagan and Dr. Frank Drake and drawn by Linda Salzman Sagan. Here are theories proposed by various writers and scientists. Astronomical Mayan influence in Nazca? Gilbert de Jong noticed that sites of Izapa (14.8 N) and Nasca (Cahuachi) 14.8 S might be related and exhibit Mayan influence. Map of Nasca region. Click to enlarge. Cistern photo. Copyrightby Gilbert de Jong. According to Dr. Malmstrom, the Mayan astronomers traveled north to find the place 'where the sun stood stil' (Chalchihuites or Alta Vista, near Tropic of Cancer, founded about 500 AD). Would it be a strange thing to assume they also traveled south? If they did, they first would have noticed the equator and find that the the sun traveled in both directions the same amount of days. When they realized this, they must have concluded that there must be a place, like Izapa, where the calendar of 260 days could also be used. So the Maya astronomers traveled to the south and found a place 14.8° S: Cahuachi/Nasca. This place worked out to be an excellent (mirror) place of Izapa. Both Gerald Hawkins, an astronomer, and Maria Reiche were not aware of this strange 14.8° coincidence. The simple truth might be that Mayan astronomers 'created' Nasca. August 13 (1359 BC) is a date that marked the sacred Mayan calendar. Could it be so that, when they discovered that Nasca was an excellent place to take long time measures, they discovered the secret of the Venus risings and settings? Could it be so that they could 'Turn back time' and find the position of planets and stars around 1,359 BC? Is that what the Nasca lines were about? 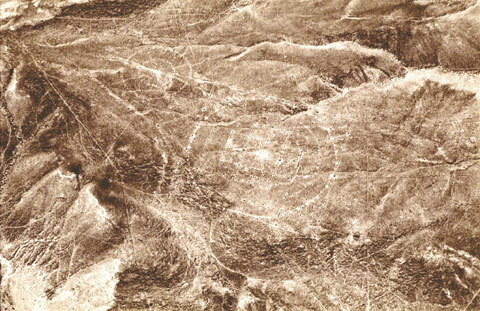 The three Nasca circles (GGF drawing) measured by Gilbert de Jong several years ago might refer to a sacred date. Wouldn't it be great? Mayans? This might be the answer on what Nasca really is: astronomical Mayan influence. Here is a story from the book of chronicler and Inca Garcilaso de La Vega. Photographs of the 'giant' skulls in the Ica museum. Copyright by Gilbert de Jong. Sodomite Flesh Eating Giants in Peru by Garcilaso de la Vega - El Inca!! "As there is in Peru a story of some giants who landed on the coast at the point of Santa Elena, in the vicinity of the city of Puerto Viejo, I have resolved to mention what I was told about them, as I understood it, without taking into account the opinions of the common people and their various anecdotes, for they usually magnify events larger than life. The natives, repeating a story received from their forefathers from very remote times, say that there came from across the sea on reed rafts that were as large as big ships some men that were so big that an ordinary man of good size scarcely reached up to knees: their members were in proportion to the size of their bodies, and it a monstrous thing to see their enormous heads and their hair hanging dawn about their shoulders. Their eyes were as large as small plates. They say they had no beards and that some of them were clad in the skins of animals, and others only in the dress nature gave them. There were no women with them. On reaching this point, they set up their camp like a village (and even in these times there is a memory of the site of their houses). As they found no supply of water they remedied the lack by making some very deep wells, a labor certainly worthy of record, being undertaken by such strong men as these must have been, to judge by their size. They dug these wells in the living rock until they came to the water, and afterwards they built the wells in stone from the water line upwards so that they would last for ages. In these wells the water is excellent and it is always so cold that it is very pleasant to drink. The meaning of Nazca (the Spanish translation discovered by Gilbert de Jong) is: ‘I am born’ or ‘I am being born’. Erich von Däniken's theory is the most famous approach to solve the mystery of Nazca. He had the idea that long time ago visitors from other stars visited the earth and naturally Nazca. At this place they landed, during the landing stones was blown away by the power of rocket propulsion. By approaching more the power was increasing and the cleaned band broader. In this way the first trapezes emerged. Later the Aliens disappeared and left confused people. Like in the modern cargo cults they tried to call the Gods back by drawing lines, figures and trapezes. Never Däniken said the formations was made by Aliens. He discovered the GGF/Mandala/Zodiac and the mirror - Formation and compares them with modern VASIS or PAPI-Signs. Visit his website. This theory means the Nazca-Lines was made by Negroid Slaves of the Tihuanaco Culture. After a revolution the Negroid population destroyed some figure, this is the explanation for overdrawn zigzag-formations. Later this people went in northern direction and founded Chavin and the Olmec culture. Robert Bast from Australia has a very interesting theory. All these animal, plant and human-shaped figures are lying together on the ground. So it could be a memorial place of the big flood. Many cultures of our world know deluge-myths, you can find a couple of them at his Side. Or visit directly the URL of his Nazca-Theory. Gilbert de Jong was himself in Nazca and measured the GGF by GPS. He obtained a length of the square side of about 54,7 Meter. In the formation he recognized a Zodiac. Nazca GGF photo. Click to enlarge. 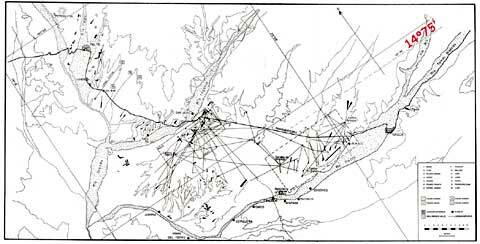 Nazca GGF drawing. Click to enlarge. 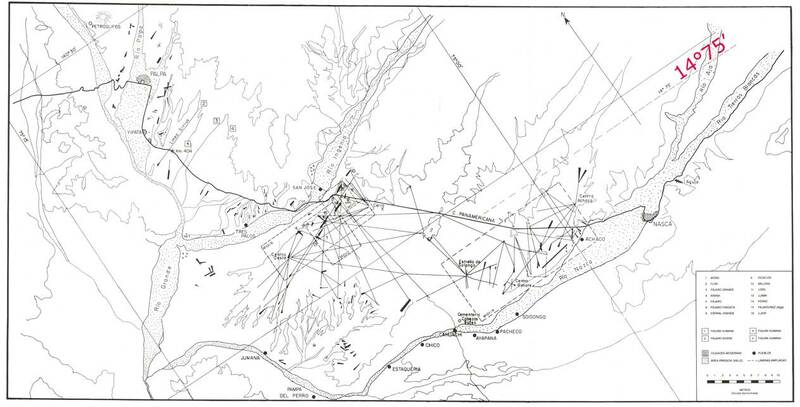 Nazca GGF drawing with details. Click to enlarge. More about at his theory you can find on his site. Robin Edgar from Canada proposes that the Nazca-Figures were inspired by, and intended to be seen by, the (so-called) "Eye of God" that is manifested during total solar eclipses. An extraordinary series of solar eclipses coincided with the construction of the Nasca lines. Some Lines are aligned with the winter solstice, a less spectacular but more regular, "death" and "rebirth" of the Sun God. Maria Reiche, the most famous Nazca-Researcher, prefer the astronomical theory. Lines should show in direction of the rising of important stars and planetary events like sun solstices. Formations like the spider and the monkey could show star constellations like Orion and Ursa Mayor. The big problem of all astronomical theories is the unknowing of the age. The direction of stars is changing within centuries because the phenomena of precession. Reiche has led a determined effort to discredit the von Daniken theory of extraterrestrials. The strategy of this attack has been to argue that the Nazca Indians constructed the Lines relatively recently - some time between 300 BC and AD 800. In support of this possibility, some scientists have put forward ingenious ideas on how the geoglyphs could theoretically have been designed from the ground. The more important evidence, however, is that which attempts to link the Lines definitively to the Nazcan culture. Here, neither of the two key pieces of evidence survive close scrutiny. The first piece of evidence is a series of radiocarbon dates, based on ceramic and wood remains which were left at the Lines by the Nazcan people. It is claimed that this proves that the Nazcans constructed the Lines. On the contrary, the dating of these materials tells us only that the Nazcans lived in the area of the Lines. Since the Lines themselves cannot be radiocarbon dated, the possibility remains that they already existed when the Nazcan culture emerged. Maria has her theories but no conclusive proof as to their construction. In 1968, a study by the National Geographic Society determined that, whilst some of the Nazca lines did point to the positions of the Sun, Moon and certain stars two thousand years ago, it was no more than could be expected by mere chance. In 1973, Dr Gerald Hawkins studied 186 lines with a computer programme and found that only 20 per cent had any astronomical orientation - again no more than by pure chance. In 1982, Anthony Aveni obtained similar results, whilst in 1980, Georg Petersen pointed out that Reiche's theory did not explain the different lengths and widths of the lines. More recently, Johan Reinhard has noted that the surrounding mountains provided a ready-made and much more effective mechanism for the Nazcans to use as a solar calendar; the lines would thus have been quite superfluous to them. In addition to this avalanche of scientific opinion, we should also note that Reiche, like von Daniken, has failed to explain the significance of the animal geoglyphs. Maria Reiche, the German mathematician and archaeologist most famous for her research into the enigmatic figures of Nazca, died in 1998 at the age of 95. She is buried in the arid valley she loved so well. 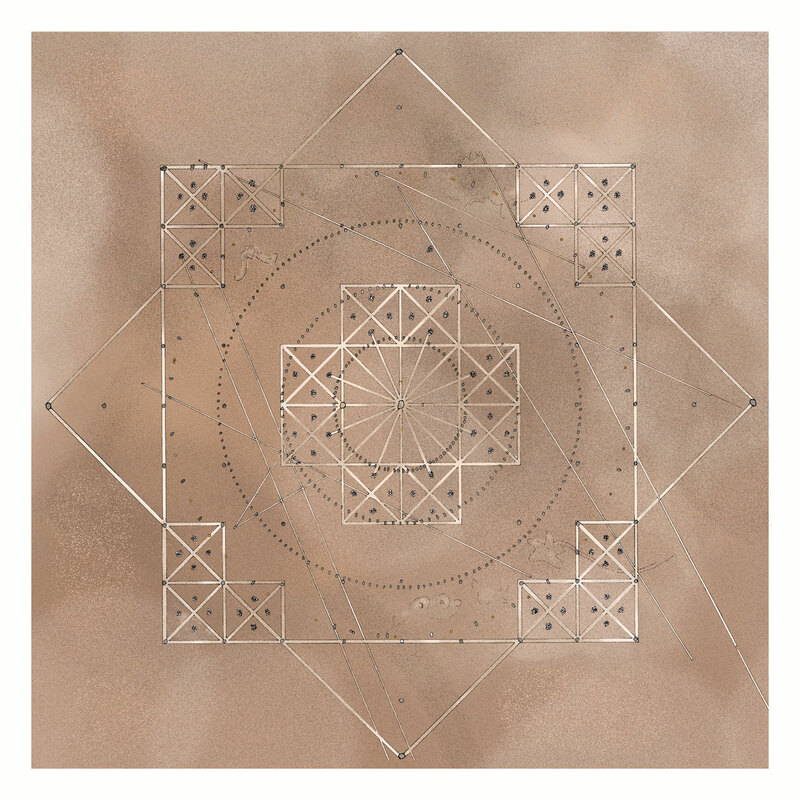 Simone Waisbard writes that the drawing of Nazca are a giant astronomical calendar. 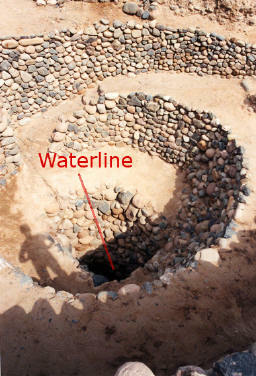 Further the Nazca-line-system was used to measure the precipitation value. Figures, especially seabirds, have a connection to the meteorological prophecy system of the Nazca-Culture. Her ideas for the trapezoid formations: places for holy animals before sacrifice them, or field claims connected with filter galleries, observatories or places for ritual ceremonies of the different clans. Hawkins and his group went to Nazca to prove the astronomical Theory of Maria Reiche. The made new and precise survey and analyzed the course of important stars by using new computer software. This Software included the star positions of the last 6900 years. After weeks of work they had very disappointed to say: We didn't find any astronomical context. Jim Woodmann made a experiment in Thor Heyerdahl's way. He let make a balloon of fine Peruvian cotton, and a basket made by Aymara-Indians. This flying object was called condor. Hot air from a fire was brought into the balloon, and really, the balloon flied away after the two pilots was escaped. So Woodmann had a new theory, they used black balloons to bury their kings. Anthony Aveni isn't a friend of the astronomical theory of Maria Reiche. He compares the Nazca-lines with the ceque-lines in Cuzco. Those lines will brought in connection with calendar, water and mountain deities. So he's the idea there's a connection between the Nazca-lines and the subterranean canalization system. In this way the Nazca-Indians celebrated a water-cult. Figures and lines was used for ceremonial dances. Michael Coe believes the Lines are sacred paths to walk by specific rites. But primary the lines was a offering for elders, heaven- and mountain-deities who spent water for fields. The famous Archaeologist has the theory, that the lines of Nazca are magic lines which origin from the cat cult in Chavin de Huantar. Breunig has the idea that Nazca was used for sprinting to honor especial gods or ritual competitions. This theory was supported by the famous professor Hoimar von Ditfurth. David Johnson believes that the Nazca-Figures are markers for subteran waterflow. Trapezoides show the broadness of the waterstream, zigzaglines show where they end, lines show into direction of the puquitos. Reindel sympatizes with Johnsons Theory, additionally he explain the nature of the figures by rod-dowsing (to find the subterran water) and shamanstic flights (to overview the figures). The Canadian Galicki recognize in the Nazca-System doubtless signals of a extraterrestrial race. Only using this point of view the big planing and work performance is plausible. 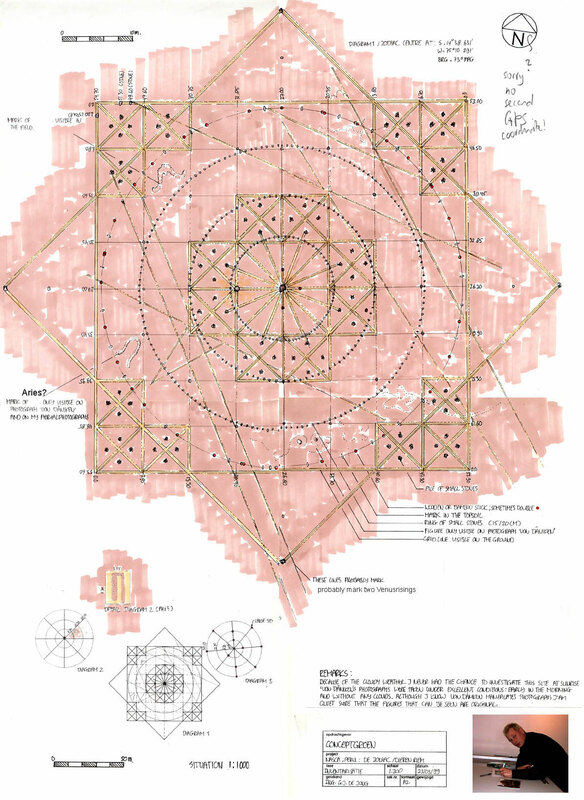 Bossi's theory bases on a formation called the GGF, Mandala or Zodiac that was discovered by Erich von Däniken 1995. This formation include a plenty of different combination possibilities and include information about the Star HD 42807 at different times and it's planet. Other formations like the monkey seems to be of this code too. The same code is to find in other places like Stonehenge, Avebury and Borobudur, but also by Crop Circles. The ancient sites around the world are very precisely positioned on a global coordinate system in relation to the position of the Great Pyramid at Giza. 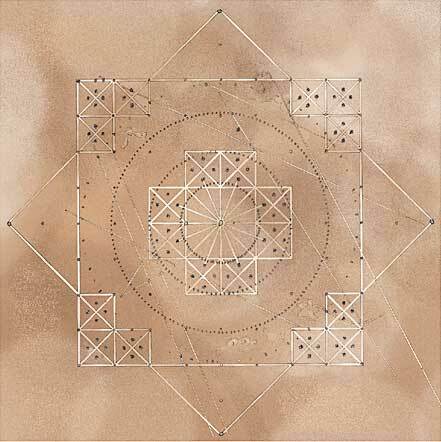 The positions of the sites are given in the geometry of their construction. A very ancient system of numbers was used in the system, which we will call "Gematria." Gematrian" numbers are found in ancient myths and religions, including the Bible. Gematrian numbers were used in systems of weights and measures by ancient peoples, including the Greeks, the Egyptians, the Persians, the Babylonians and the Romans. The Code system uses mathematical constants, such as pi and the radian. The system also uses conventions that are still in use, such as the 360 degree circle, 60 minute degree, 60 second minute, the base-ten numbering system, the 12-inch foot, and the 5280-foot mile. The Nazca Line ground markings "locate themselves" on The Code Matrix System. For more detailes visit Carl Munck's website Nazca Lines and Archaeocryptography. Tributsch has the idea that important cult places like Stonehenge, the Pyramids and naturally Nazca were built on places where often the Fata Morgana - Phenomena occurs. In this way People could see the Fata Morgana of the Nazca-Lines. Jiri Murzek has another solution to Nazca Lines, and Figures. It is a very complete solution of the monkey's figure. It involves geometrical code, which speaks of specific aspects of analytical geometry. This code coincides with the code of prehistorical La Marche, France. John D. Miller analyzes different buildings worldwide. So he found in ancient buildings and old cathedrals often the value of 177 Feet. His theories are based on several holy numbers and units, so he believes that there is a deeper importance within. He's a private researcher of ancient mysteries. When he saw the figure of the GGF, he recognized the ground principals of a cathedral. In the heat stones perform a patina of manganese oxide, traces of iron and clay minerals. Below the stone advanced mushrooms, lichens and cyanobacterias. Such stones in neighborhood to the lines could be used to analyze the organic matter by C-14-Method. The idea is those stones was turned during the line-drawing. In this way values between 190 B.C. and 600 A.D. could be found. How many stones was analyzed? Only nine pieces! 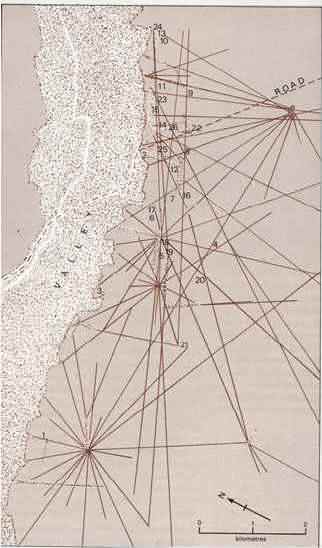 Stierlin thinks the Nazca-Indians used the line-system as loom. In the paracas-culture was made textiles witch was made of one string. But the Indians hadn't wheels and looms, so they organized hundreds of men who held the string. Their position was defined by the lines. The Hungarian mathematician Dr. Zoltan Zelko analyzed the Nazca-line-system and compared with other ancient places in Peru. So he found out that Nazca could be a map of a 100 x 800 kilometer including region around the Titicaca-Lake. Evan Hadingham's proposal to solve the Nazca-Mystery is the use of powerful plant hallucinogens like Psilocybine. In this way they made shaman flights and saw the formations at the area. The reason behind the lines are mountain-deities. Helaine Siverman, the co-author of Anthony Aveni has additional the idea that the figures are clan signs of different Indian clans in the region of Nazca. 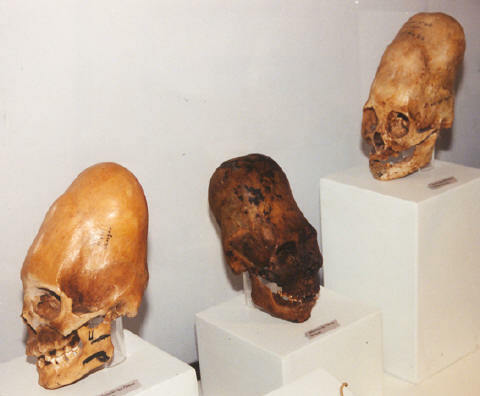 The main interest of Mason are the tombs and the deformation of skulls of the Nazca-Culture. About the lines his comment is: Signs for Gods in the Sky. Albrecht Kottmann tried another approach to the Nazca-Mystery. He divided the figures into different parts and analyzed them in a geometrical way. So he divided a bird of 286 Meter length into 22 Parts. So he found that the head takes two parts, the neck five parts, the body three parts and the other twelve parts for the beak. The proportion between the beak and the rest is 6:5. Kottmann believes the geometric signs are a picture writing system with giant and small letters. He's the theory that the kings of Nazca ordered the drawing of the nazca-line to control the population. When they did work they couldn't make children at the same time. Why this? Isbell has the idea the Nazca-Indians wasn't able to store field fruits, so in good years the population were increasing to strong.